NGC 1931 is a relatively young open cluster surrounded by emission and reflection nebulosity (Sharpless 2-237) in the constellation Auriga. 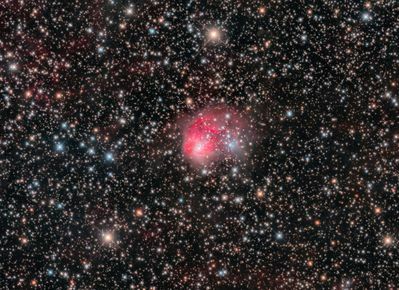 Faint red hydrogen emission can be see in the region surrounding the compact cluster/nebulosity. Sharpless 2-237 shows both red hydrogen emission and blue reflection nebulosity. Image was a total of 15 hours of exposure through a Takahashi CCA250 f/5 astrograph with a QSI683wsg camera @ -20 degrees C. (Astrodon Gen 2 filters) on a Paramount ME on the nights of 23, 30 Nov and 5 Dec 2016 and 13, 18, 19 Jan 2018 in Mayhill, NM (Lum 30 x 1200 sec; Red 5 x 1200 sec; Green 5 x 1200 sec; Blue 5 x 1200 sec; with corresponding Flats, Darks, and Bias). Processed in PixInsight 1.8.5.1353 Ripley (x64). Color calibration and RGB image stretch with PixInsight's Photometric Color Calibration and Arcsinh Stretch, respectively.